We spent most of the day on the main floor at Star Wars Celebration V in the Orange County Convention Center to bring you this video overview and photo gallery. As expected, the lines were long this morning when the doors first opened. Long lines continued inside at many of the booths offering exclusive and free merchandise such as Lego, Hasbro and Disney. But don’t worry if you’re still planning on attending, most booths are only offering a limited amount each day so they won’t run out too fast. But spending money isn’t all there is to do. There are many photo opportunities that are free, some cool free giveaways and lots of neat things to see. Besides the show floor, there are panel discussions going on all day as well as movies, games and costumes to check out. 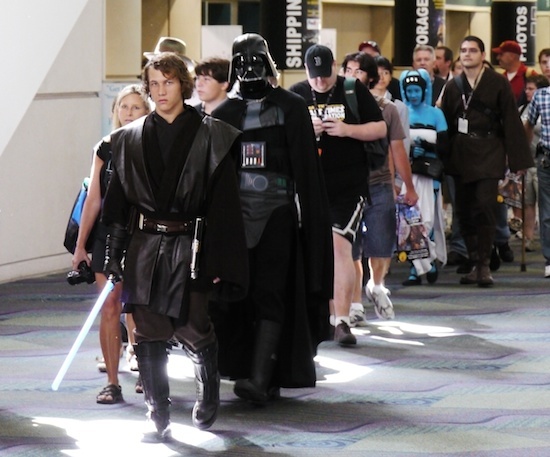 The Star Wars convention runs through Sunday, so keep checking our Twitter feed at Twitter.com/Attractions throughout each day and back here for our complete coverage. We’ll also be covering The Last Tour to Endor special event at Disney’s Hollywood Studios Saturday night.